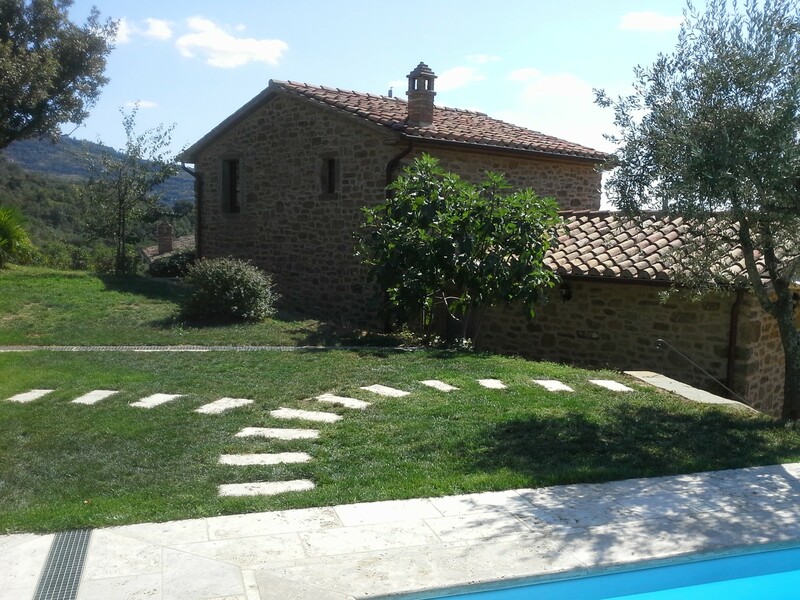 This is the gorgeous villa we had the pleasure of staying in for our summer holidays- and we could have very easily stayed here for week after week after week! 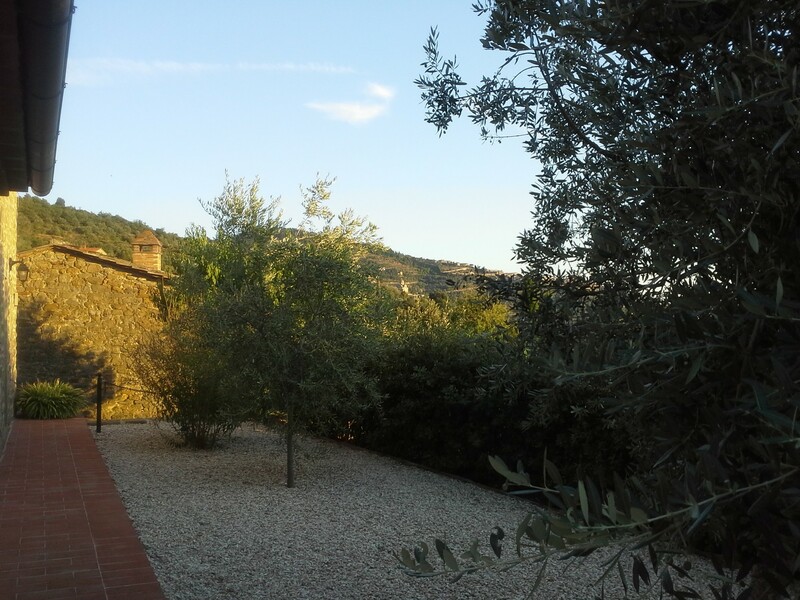 A couple of km’s from Cortona in the south of Tuscany, this villa was up in the hills and surrounded by olive trees and sunshine. Utterly heavenly. We arrived on Saturday to glorious sunshine and made our way straight to the villa- well almost straight there, a hairy wrong turning up a very ‘white’ road up the mountain made me begin to question my desire to be somewhere remote! 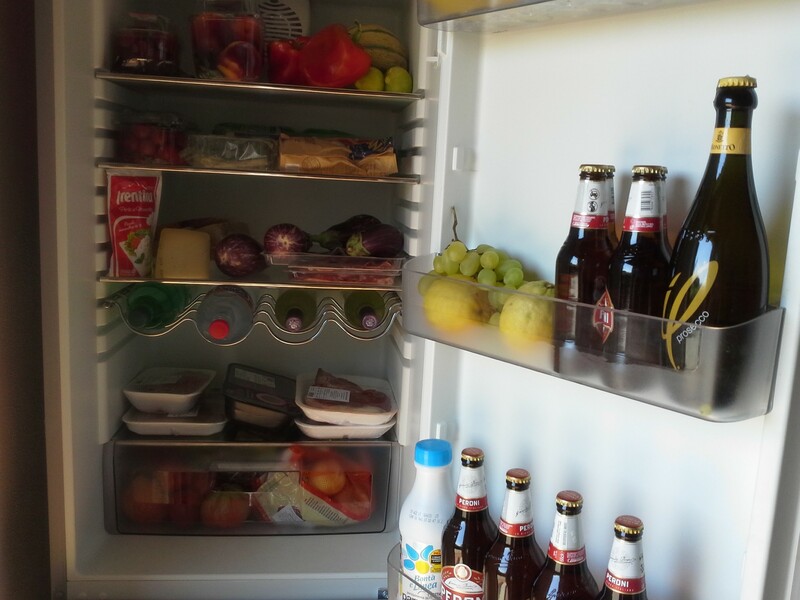 However, the right road was found with help from a very nice Italian man (and was still scary but compared to the wrong road we were relieved), the villa was moved into and the fridge was full. I absolutely noticed a big change in my cooking habits here. Because we were buying everything fresh and deciding what to cook on the day with very few ingredients, but all really tasty, cooking briefly and simply. Maybe it’s the quality of the ingredients, or the relaxed state we were in but everyday we ate plates of happiness- whether out in restaurants or at home at the villa. We spent our first day lounging by the pool and enjoying a glass of wine- the first in a month!!! And well worth waiting for. 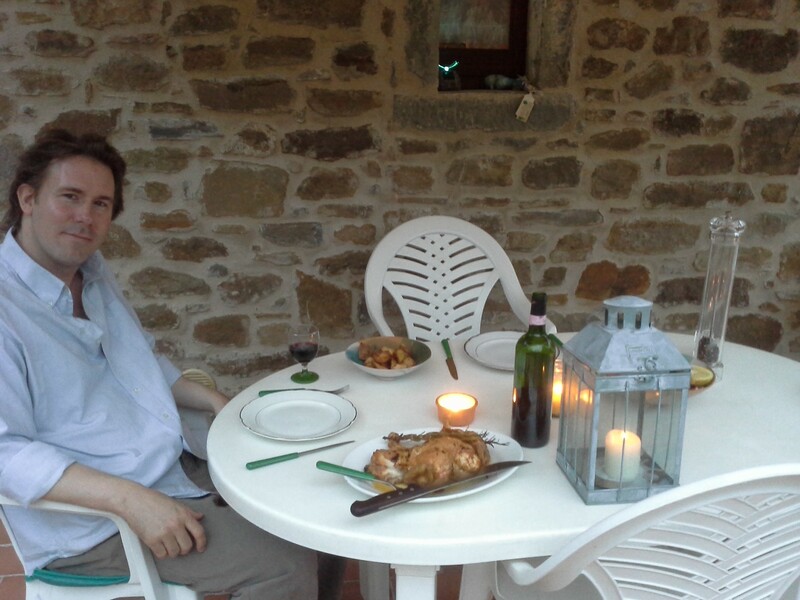 The first dinner had to be a Florentine steak, grilled on the bbq and washed down with some good Tuscan red. After a brilliant night sleep in utter darkness and quiet we got up, jumped in the car and drove down the hill and back up the next hill to Cortona. We climbed to the top of the town and admired the fabulous view. We watched a lovely elderly couple strolling arm on arm in the sunshine with their food for the day- may be a vision of the future for the Thomas’s! A day by the pool with chilled Vernaccia and our piles of books beckoned, before I could summon up the energy to head to the kitchen. 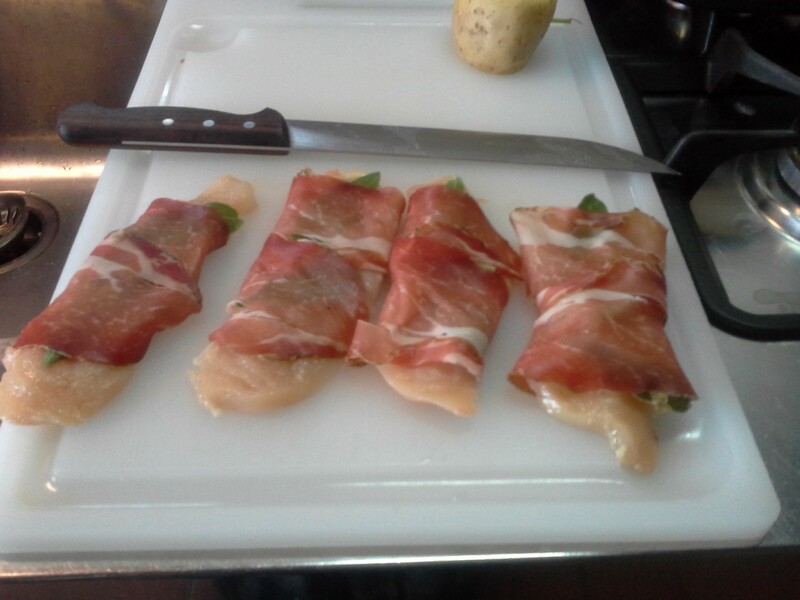 I wrapped the thin chicken fillets with a sage leaf and some cured ham, then fried them in olive oil quickly, deglazing the pan with some white wine to create a tasty jus. For dessert I bought a berry tart from the shop in the afternoon which was utterly delicious, and gave me plenty time to relax in the beautiful sunset. We woke up on Monday morning to blazing sunshine, and after negotiating the small dog and mini kittens on the road down the hill (very, very cute!) we drove off to Arezzo. After walking the town and admiring an ancient church backing onto the Piazza Grande we headed to ‘La Lancia D’Oro’ for lunch under Vasari’s arches. 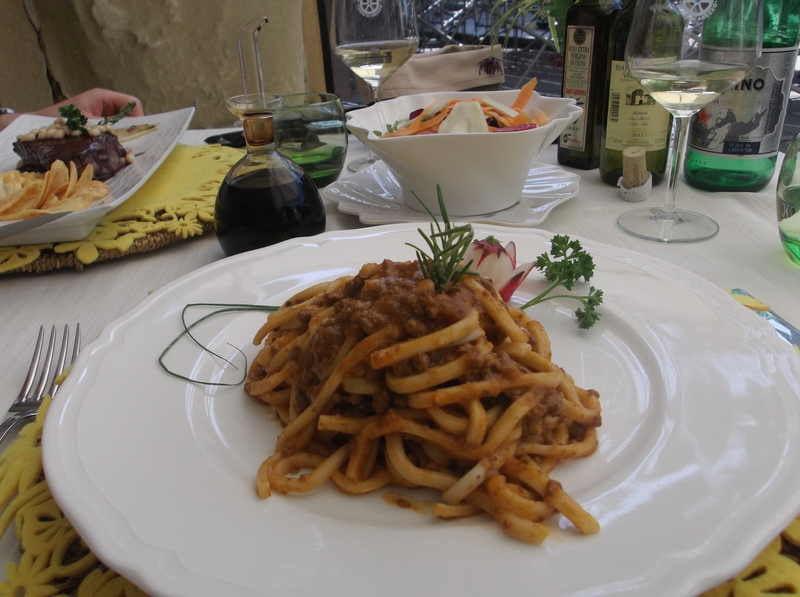 For me the local ‘pici’ pasta with a ragu of duck. 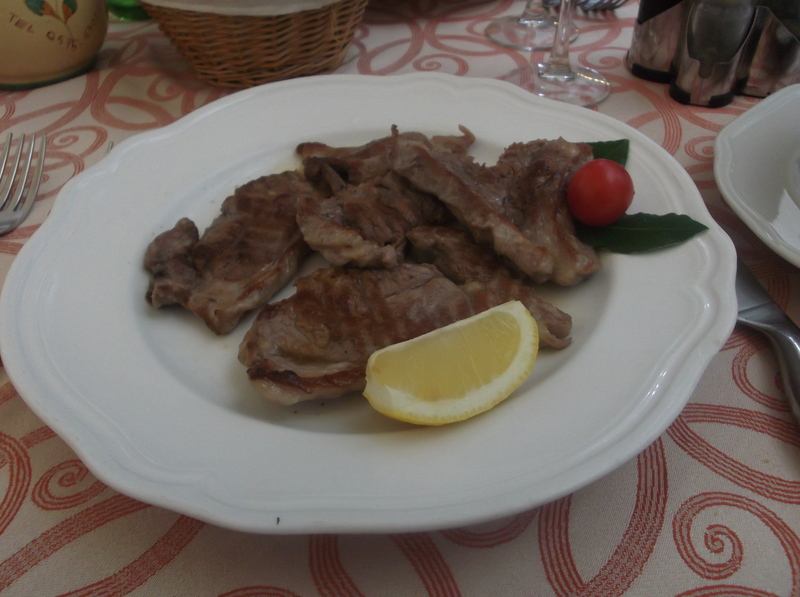 For Colin a Bistecca de Manza, grilled maybe a little too rare, with waterfall beans! In fact he only ordered it to see what the beans were! And they turned out to be a little like a Cannellini bean, cooked in the delicious juices of the steak and finished with some wine. A lovely lunch on a beautiful square. 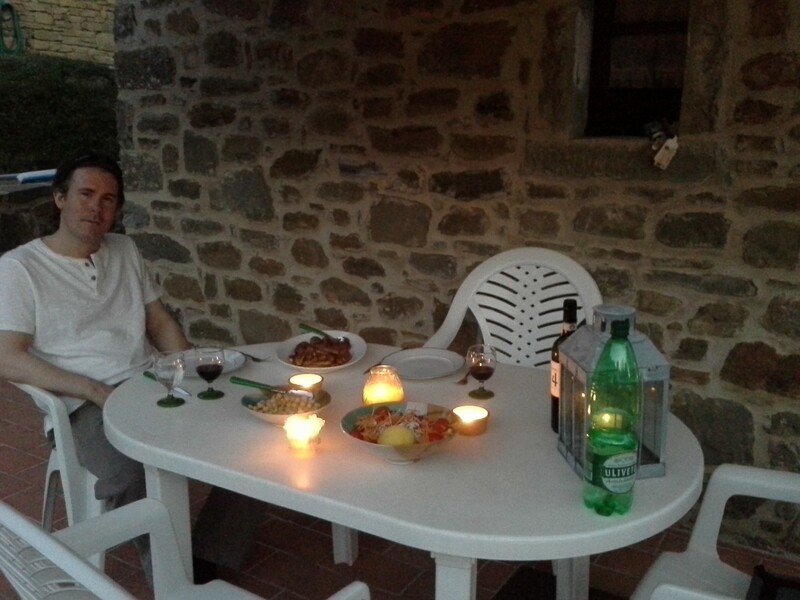 It would not be a holiday without some of Jo’s Famous Meatballs, so Monday night was meatball night! 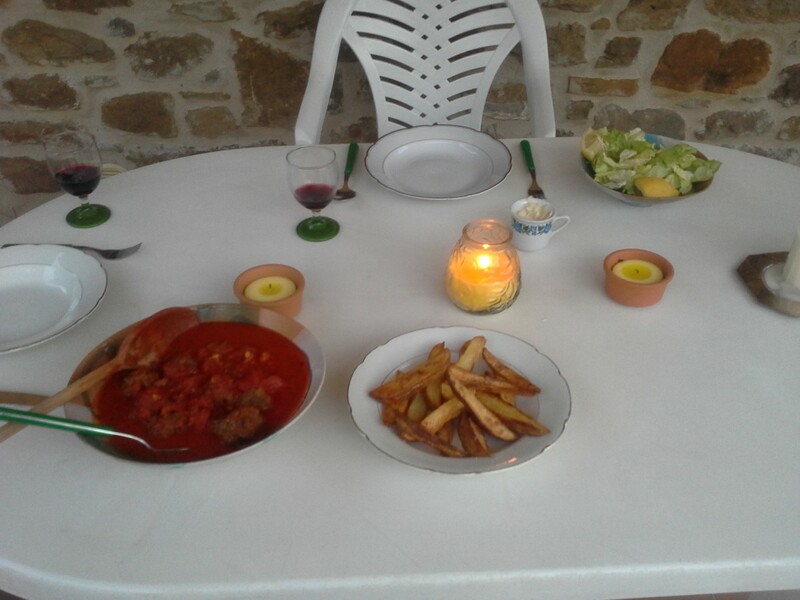 Simply made meatballs with meat, a little onion and garlic and poached in a sauce of white wine and tomatoes, served with some olive oil roasted potatoes and some salad. Washed down with a Chianti, and big smiles all round. 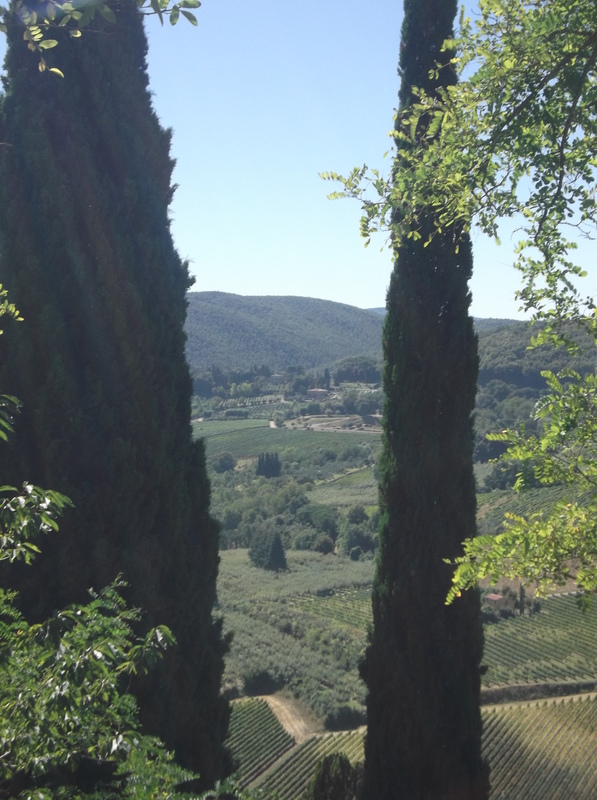 Tuesday was a day of towers- a must day in Tuscany! Monteriggioni was our first stop for a walk around the ancient stone walls to view the countryside, followed by San Gimignano, which was very full of tourists, and very hot. 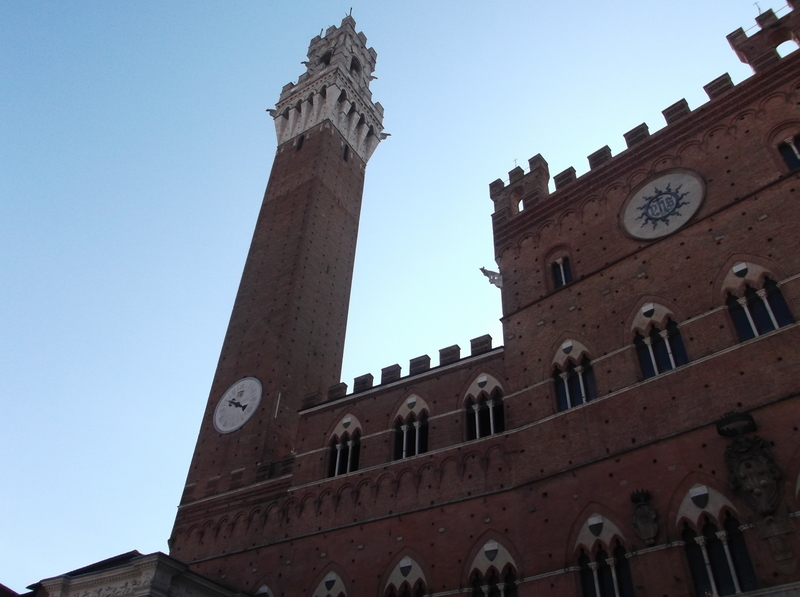 We had salad at a café with a picturesque view of the main squares with a San Gimignano white to feel at home! We found some delicious Italian sausages for dinner- so well seasoned, and not too much fennel in there. I simply grilled them for dinner and served them with some salad and some lentils. The shops are filled with lentils and chickpeas and I simply cooked them and sautéed them with a little onion, garlic, carrot and rosemary with some of the olive oil from Ivana, the lady who owns the villa we are staying in. Simple, delicious and healthy to boot. We tried some Vino Nobile de Montepulciano in readiness for visiting the town tomorrow! 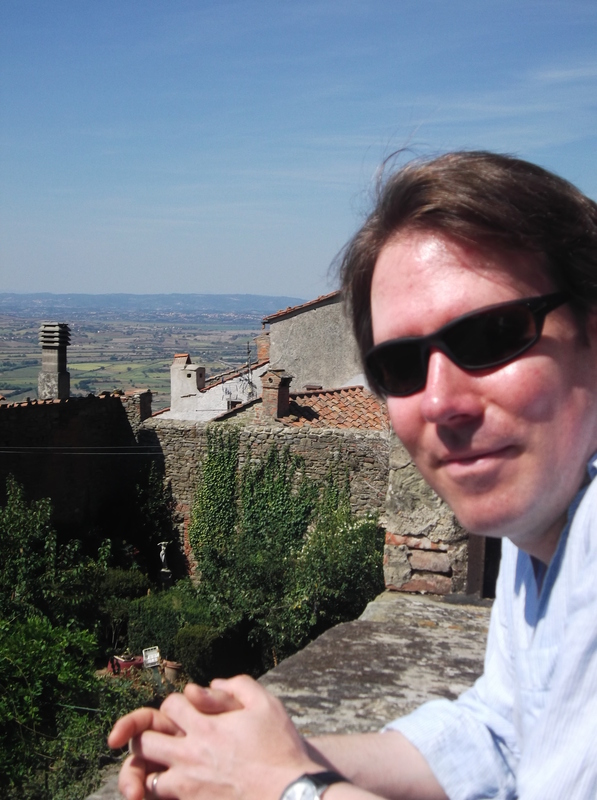 On Wednesday morning we jumped up and drove out to Montepulciano. We walked the old town and had a coffee in Café Poliziano, with it’s grand café feel and amazing views and then headed to Pienza for lunch at ‘Latté di Luna’. Pici pasta for me with a spicy tomato and garlic sauce, and some spaghetti ragu for Colin. The restaurant was packed out so we had to sit inside, but it was worth it- all delicious with friendly service, and I would love to go back in the evening to test out the full menu. I made some pizzas for dinner: one with some local salami, and one with some grilled veg. Red wine watching the sun go down and the lights across the valley in Cortona come on. Watching the stars in the really black sky. I believe this may be heaven. 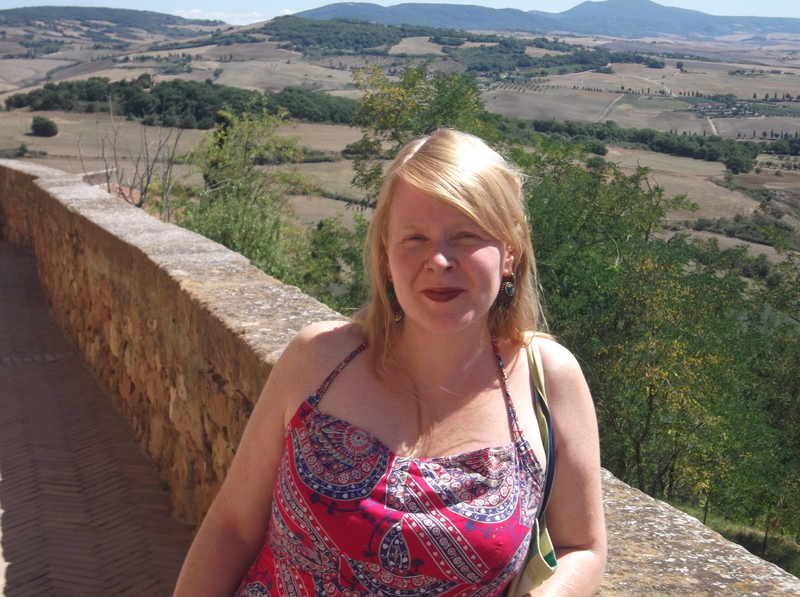 On Thursday we drove to Assisi, mainly because it was close by and we felt we should see it, but it felt decidedly like a theme Park so we left early and had lunch by the pool- some pasta with wild boar sauce (shop bought but yummy!). The day was so hot I had to have a little lie down inside to cool down! How will we get used to being back home? For dinner we bought more of the delicious sausages, this time making a chickpea salad as an accompaniment- simply tossed in olive oil, herbs and a little onion. On Friday we headed to Siena. What a beautiful day to sight see a beautiful city! 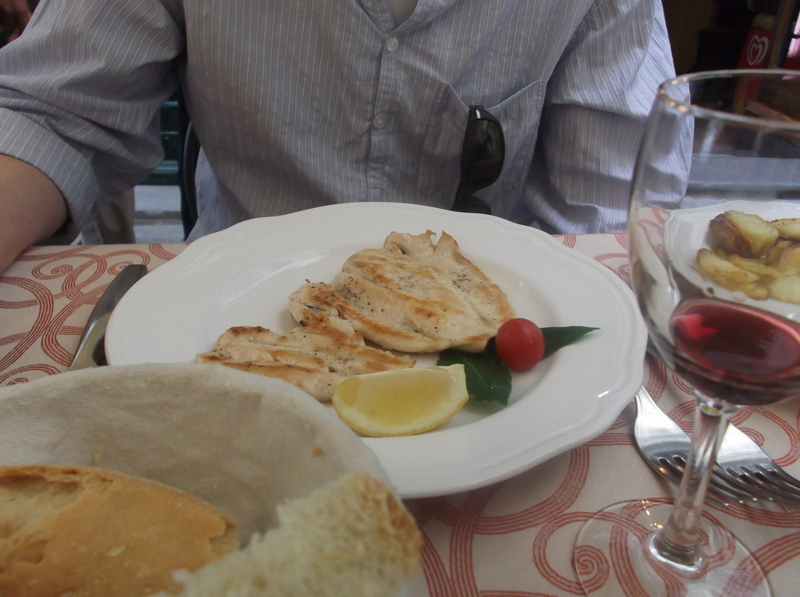 We wandered for a while taking in all corners of the city, then headed to ‘La Logge’ for a delicious lunch. My main course was amazing, and a little unusual as it was seafood in a very meaty area. 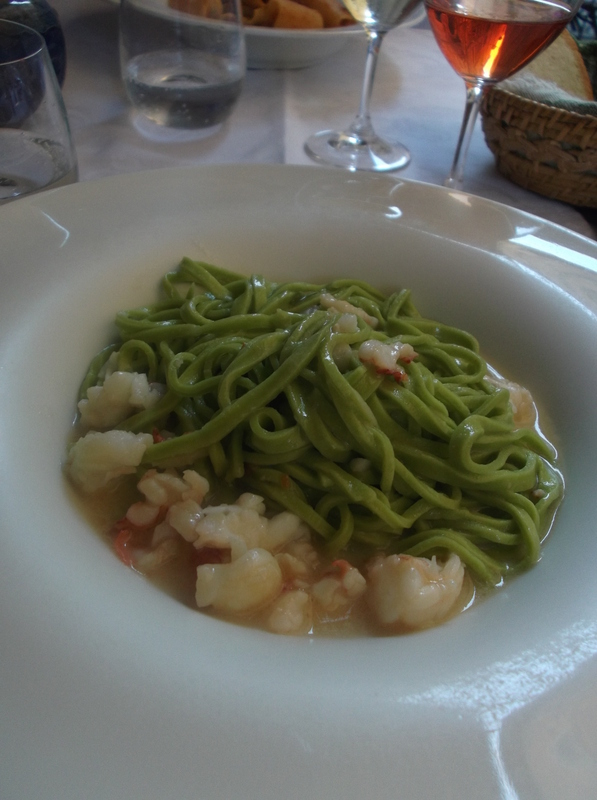 Green pasta with a crayfish sauce- which tasted very special. It looked like the sauce was simply white wine, juices from the crayfish and maybe some garlic. However, it was also hot from chilli and pepper, which you couldn’t see on the plate but could taste in your mouth. Amazing. Colin had some ‘elephante’ pasta with a ragu which looked very tasty, and didn’t last long at all! We are not often tempted by dessert at lunchtime but we couldn’t say no here. 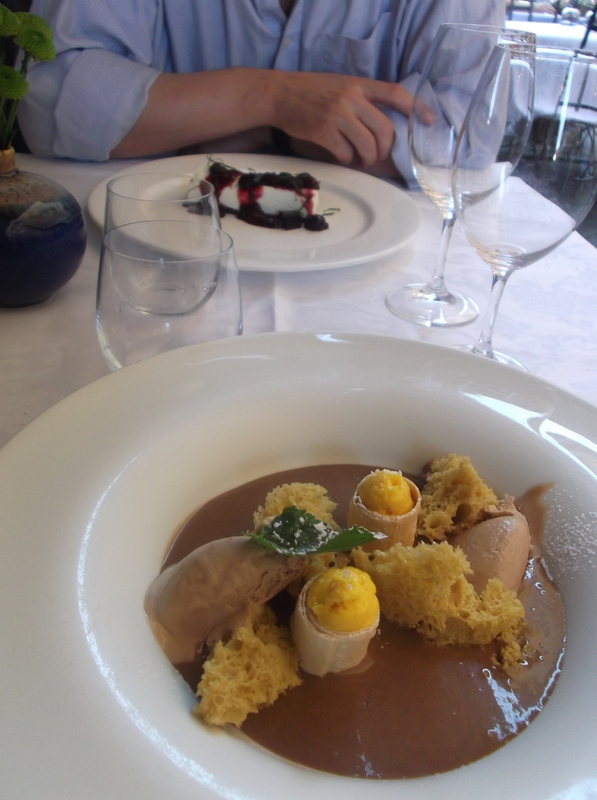 My dessert was a trio creation of hazelnut- a sponge that looked like a torn up bath sponge, hazelnut ice cream, hazelnut and chocolate sauce- sounded intriguing and tasted wonderful. For Colin there was a blueberry cheesecake which also did not last very long which is a good sign! When we woke up this morning we thanked our lucky stars that we decided to book for longer than a week- or we would have been packing our suitcases and heading home! Instead we headed to Perugia, the city we flew into a week ago. A great city, much more cosmopolitan than the other towns we’ve visited in Tuscany, mainly down to the University influences. It was also filled with very well dressed people heading to the town hall for weddings, a good job we put our best on! Lunch was back at the villa by the pool- salamis, cheese, salad and lovely bread. Dinner was some tortellini and tomato sauce. We were thanking our lucky stars again as the weather forecast was not so great for today and it was actually roasting hot so we made the most of it by the pool. Spending so much time outside has been one of the real highlights of this holiday. Sunday, and the final day of the holiday. The sky was a little overcast so we drove back to Cortona to do some last bits of shopping (ceramics, bags, wine!) and our final lunch at ‘La Grotta’. Crostini to start, Grilled lamb for me and chicken for Colin. Happy jug of wine, followed by some vin santo and cantucci to finish. Heavenly. we are seriously considering booking the same villa for 2 weeks next September. 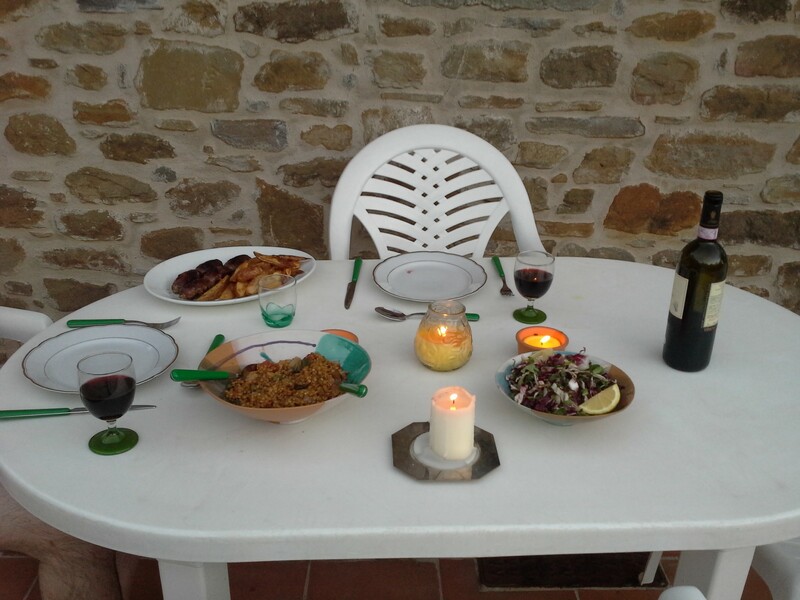 There is nothing I would change about it- the location, the food, the wine, and above all the company- a happy Thomas holiday.